During the 2014-15 school year, the mental health team at the Catholic District School Board of Eastern Ontario (CDSBEO) worked together to create a resource that would help build student resilience and positive mental health for educators. The team wanted a resource that captured past progress, classroom strategies that teachers and support staff would find useful as well as community resources staff could access for more support. We wanted educators to know that they were not alone in supporting struggling students and that they have a process and a team of people to help. 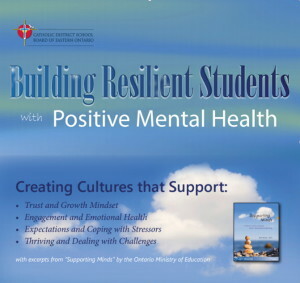 In 2012, Dr. Wayne Hammond visited CDSBEO to present staff with his Resiliency Framework for the first time. He described the 31 developmental strengths that resilient people possess and explained how these can be cultivated and nurtured. Students completed their first Resiliency Surveys developed by Resiliency Initiatives. Then, schools were asked to complete Action Plans based on student feedback so that each school could further promote resilience. From here, we built on our appreciation of the Resiliency Framework. We used it as the basis of our Bully Intervention Plan. We connected it to pre-existing work to build student resilience, such as Proactive Circles, the Roots of Empathy Program and Restorative Practices. We linked it to supports for struggling students. Again, students from grades 3 to 12 completed the Resiliency Survey; school mental health teams received the results; and schools created action plans to build on their work to create cultures of resilience. Last school year, our Board Mental Health Team identified four themes contained in the Resiliency Initiatives’ 31 developmental strengths: Caring Relationships, Meaningful Engagement, Establishing Expectations and Healthy Responses. We created a poster as a reference for school teams, showing which of the 31 developmental strengths fit into each category. We also highlighted the link between Resiliency and Positive Mental Health. We wanted educators to appreciate that, by building student resilience, they could help foster student mental health. We created a poster to capture this connection. After students did their Resiliency Surveys – which now included mental health questions – schools again created action plans to build cultures of resilience and positive mental health. As 2015 began, we had all 42 of our school mental health teams complete a survey about perceived mental health needs and strengths in their schools. The teams identified their top three mental health concerns as: 1) Anxiety; 2) Depression; 3) Addictions. The Flip Book has five sections: 1) Building Resiliency and Positive Mental Health (putting everything together and depicting how we got to where we are now); 2) Belonging – Trust and Growth Mindset; 3) Hopefulness – Engagement and Emotional Health Free from Difficulty Managing Moods; 3) Optimism – Expectations and Coping with Anxiety and Stressors; 4) Empowerment – Thriving and Dealing with Challenges and Challenging Behaviour; 5) Resources – Where to go for Help. You’ll notice that the book captures the three main concerns our schools identified – anxiety, depression and addictions – while staying focused on resilience and strength. The book refers to the Ministry of Education document “Supporting Minds,” from which it draws many of its classroom strategies. In the section “Resources – Where to go for Help,” a flowchart ensures that teachers and support staff know what to do when a student is struggling in their classroom. The flowchart within the Flip Book itself is generic, as this same Flip Book is being provided to all schools. However, each school also received larger, community-specific flowcharts with specific agency names and contacts – to use after a student’s needs are explored. Teachers and support staff have shared wonderful feedback regarding this flowchart; they now feel much more capable of helping connect a struggling student to the right community resources when required. On the back of the Flip Chart, there is a poem entitled, “Finding Your Heart” by Tom Krause. We thought that this poem would be ideal for the back of the Flip Book as the theme of this poem is that you are not alone. When introducing school staff to this resource for the first time, this poem was read aloud. Teachers and support staff were reminded that, just like the students who are not alone in their struggles, neither are they alone in their work. Our dedicated Board Mental Health Team is always available to support staff members who are struggling to support a student. Indeed, they are not alone. View a copy of the Building Resilient Students Flip Book here. The Flip Book now hangs in each classroom in all 42 of our schools. The feedback we received since its launch has been sensational. Teachers and support staff find the resource comprehensive; they tell us that the strategies are realistic and practical. At case conferences, staff can explore the Flip Book with parents to better understand a student’s strengths and needs. By introducing this new resource, our staff feel more confident and capable when supporting students and building their resilience and positive mental health. They also know that they are not alone as they provide amazing support and guidance to students every day.